Bioglan Cacao Boost contains the superfoods Cacao, Lucuma, Maca and hemp for their energy-enhancing properties in this unique organic blend. Lucuma (a fruit native to the Andean valleys of Peru) and Maca (a root vegetable also native to the Andes) give the blend a delicious malty, caramel flavour. These blend perfectly with the richness of Cacao and the nuttiness of hemp, which is also a source of protein. Protein contributes to the maintenance of muscle mass. Mix 2-3 teaspoons (10g) to juice, smoothies, yoghurt, cereal, baking or other foods you enjoy daily. Ingredients: Cacao Powder (35%), Lucuma Powder (30%), Hemp Protein Powder (22%), Maca Root Powder (13%). 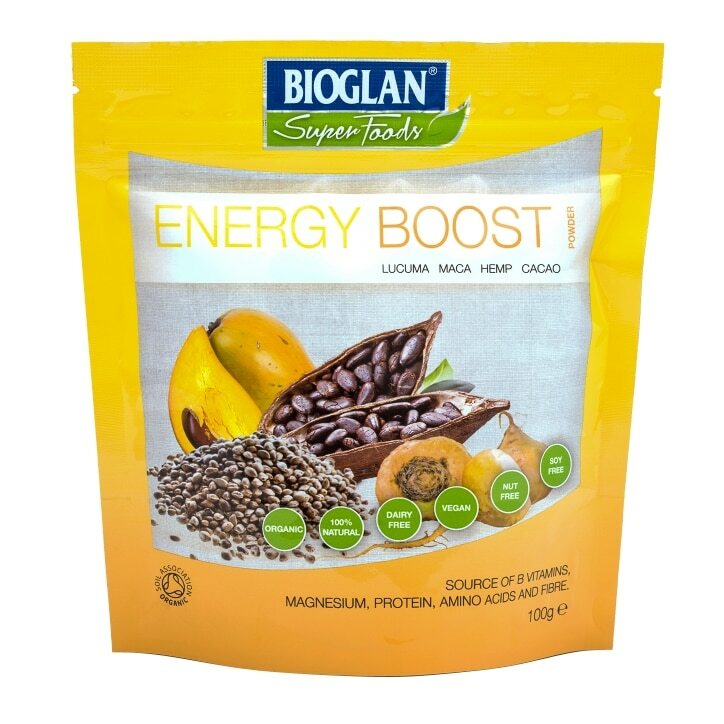 Bioglan Cacao Boost is rated 4.8 out of 5 by 14. Rated 5 out of 5 by Mismail from Great product High quality and super ingredients. Great product! Rated 5 out of 5 by Abanks from Love this! I recently bought the above boost and the super greens, I love this one the taste is awesome, and I do really feel I have more energy. I will buy this again! Rated 4 out of 5 by Yard from Tastes great. Too early on to state if it works yet, but will keep using. Rated 4 out of 5 by sarat from Nutritious and delicious I have tried a number of nutritional supplements based around cocoa and this product has the same quality about it. Good texture and flavour and perfect for adding to my morning breakfast smoothies, making a nice change from just fruit flavours. Rated 5 out of 5 by Polly64 from Energy boost for me. Needed energy boost,found it,makes super smoothies,mixes well.great taste.